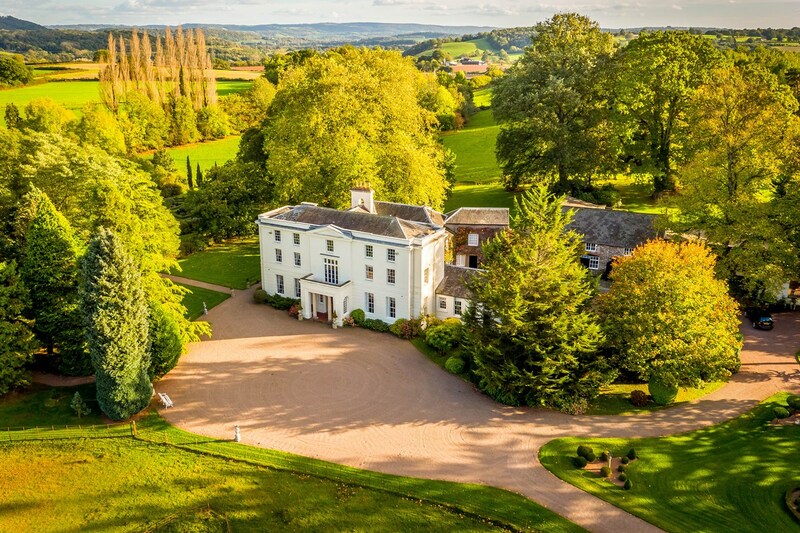 This elegant manor house with a grand Georgian facade sits within 34 acres of grounds, behind a curved stone wall and is approached by a tree lined drive. 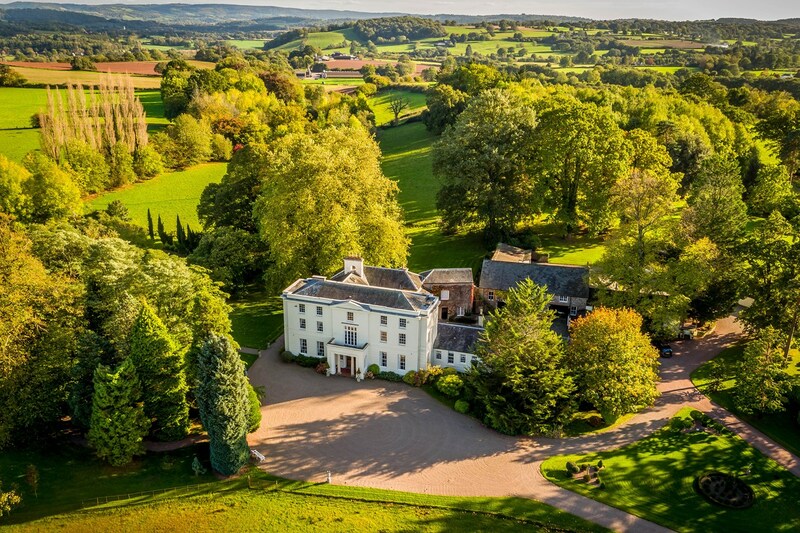 The historic property enjoys panoramic views across to The Skirrid and Sugar Loaf mountains. A Grade II listing has ensured much of the Georgian period design remains. 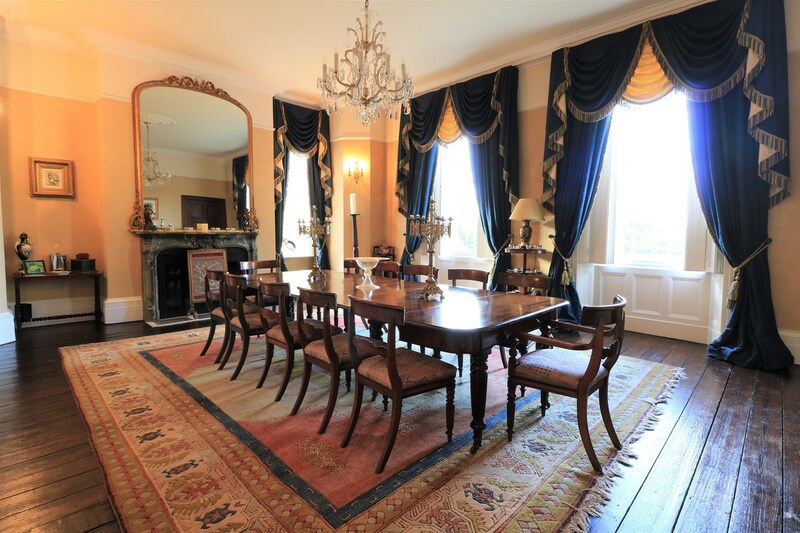 In particular the panelling beneath the shuttered windows, wide internal doors, 12ft high ceilings, deep skirting, picture rails, decorative coving and exceptional fireplaces. Beyond the Georgian façade are far earlier sections of the house enveloping a courtyard of outbuildings and stabling. Steeped in history this regal residence has noted royal connections where it has been said that the Royal Princess Margaret was often a guest. 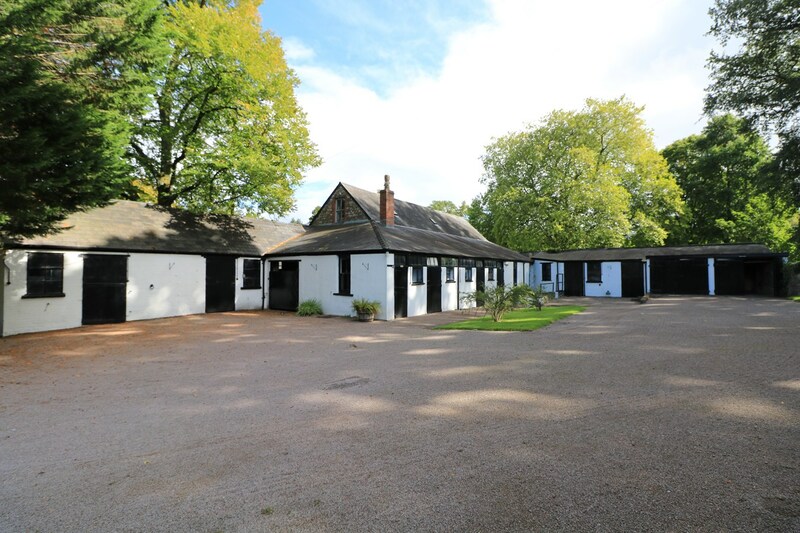 Also, home of the Foxhunter stud, founded by Sir Harry Llewellyn in memory of his famous showjumper, a Gold medal winner in the 1952 Helsinki Olympic games and now the name given to the local public house. 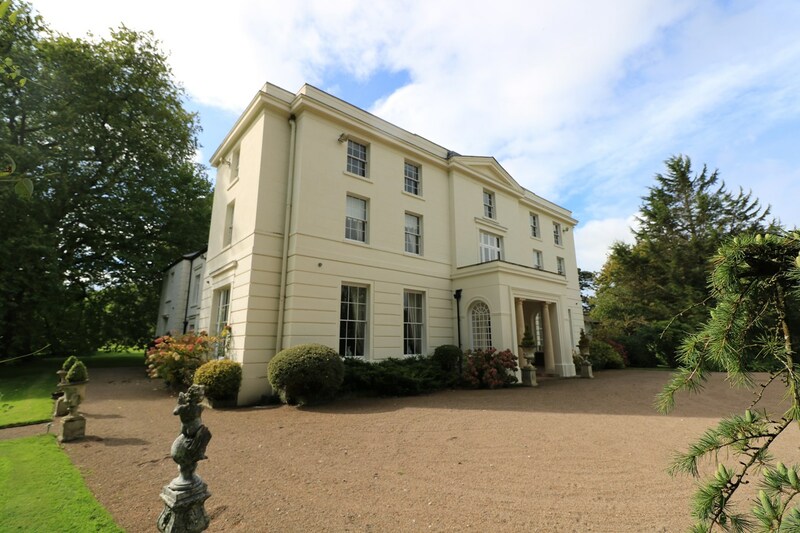 Located in a rural setting, Nantyderry is a quiet area yet within easy reach of the A40, M50, M5 & M4, Abergavenny being 6 miles and Newport 14 miles distance, both offering rail links. The renowned restaurants, The Hardwick and The Walnut Tree are 5 minutes and 15 minutes’ drive respectively. The Celtic Manor Resort off junction 24 of the M4, is only 16 miles. 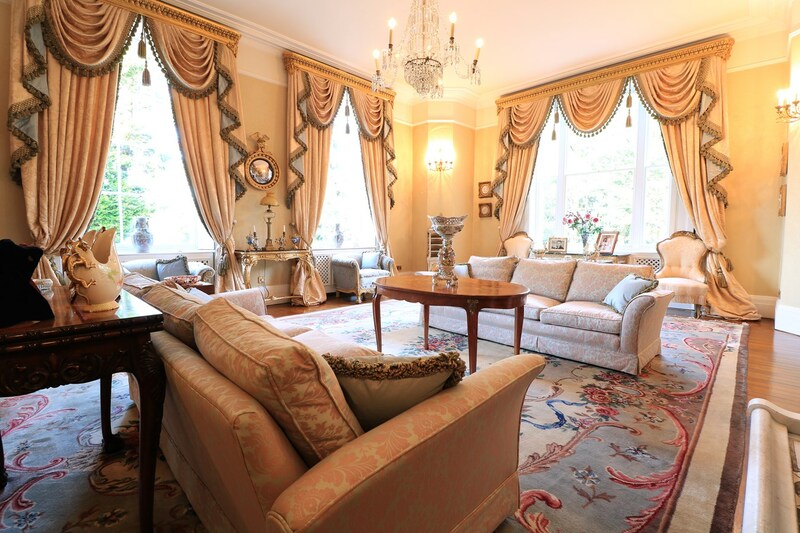 Presently an exceptional family residence, this Georgian Manor lends itself to many business opportunities. 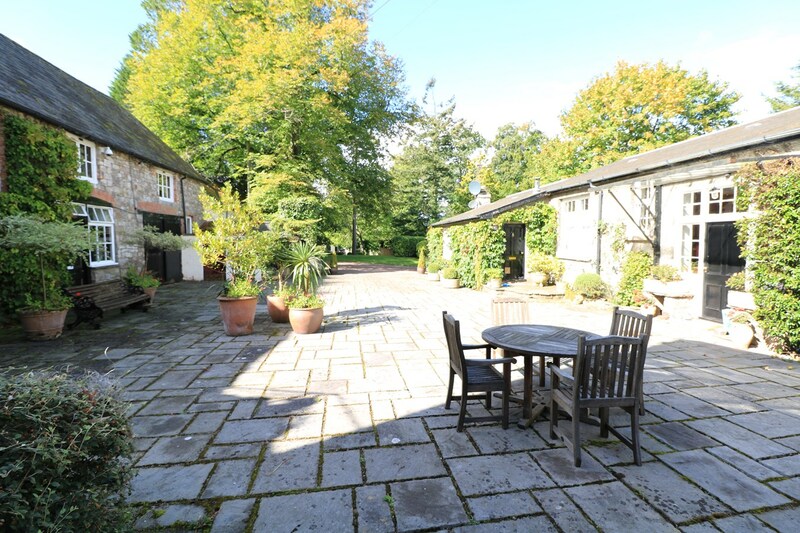 Historically this home has an equestrian background which is evident within the 12 stables, hay stores and outbuildings in the 34-acre grounds, offering great potential to the racing community and equestrians. 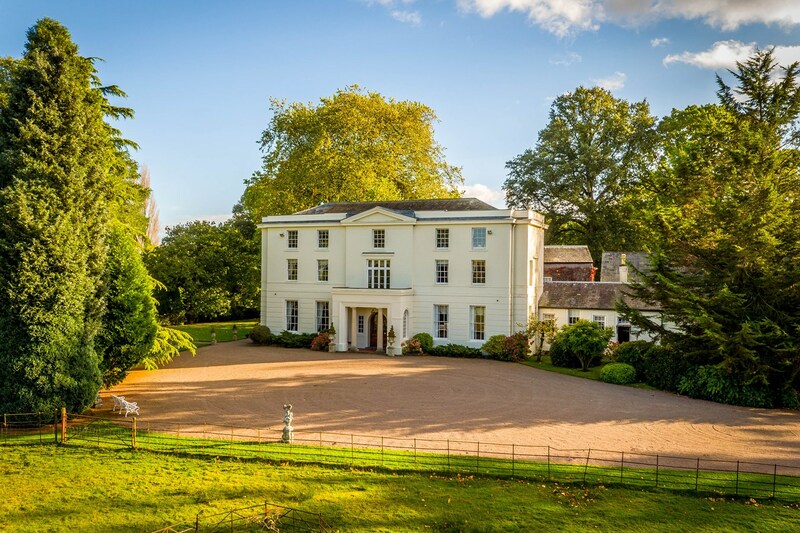 Originally home of the Olympic champion horse Foxhunter, trained at the house by Colonel Sir Harry Llewelyn who became the winners of the 1952 Olympics together in Helsinki. 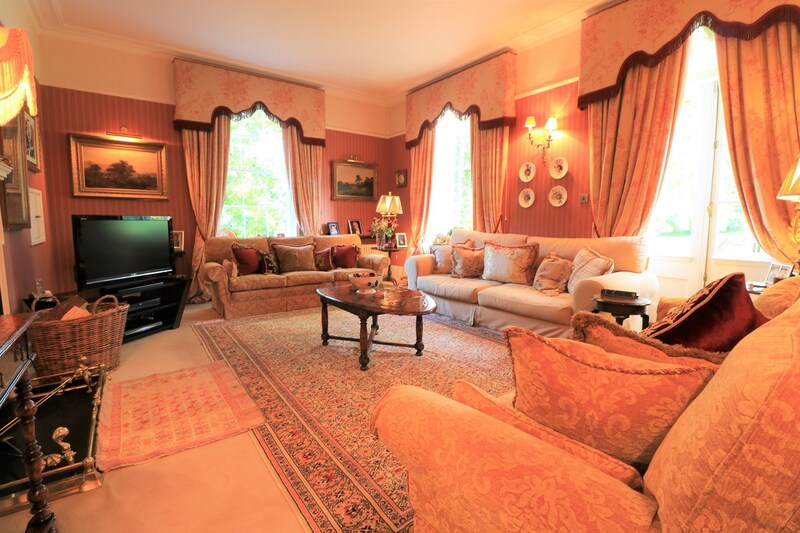 The 11 bedrooms, 3-bedroom apartment and outbuildings all provide the required space for a luxurious country hotel. 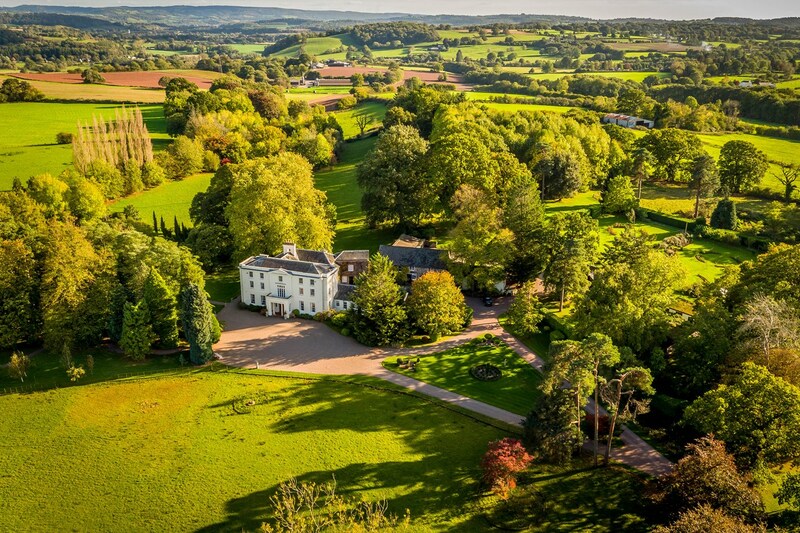 The main house with over 20 rooms, would make a perfect serviced office building with the stunning grounds suiting a conference or wedding venue. The superb, quiet, semi-rural surroundings yet enviable commuter links add to the endless potential of this outstanding period home and outbuildings. A pillared portico entrance leads through double doors into a classic vestibule. 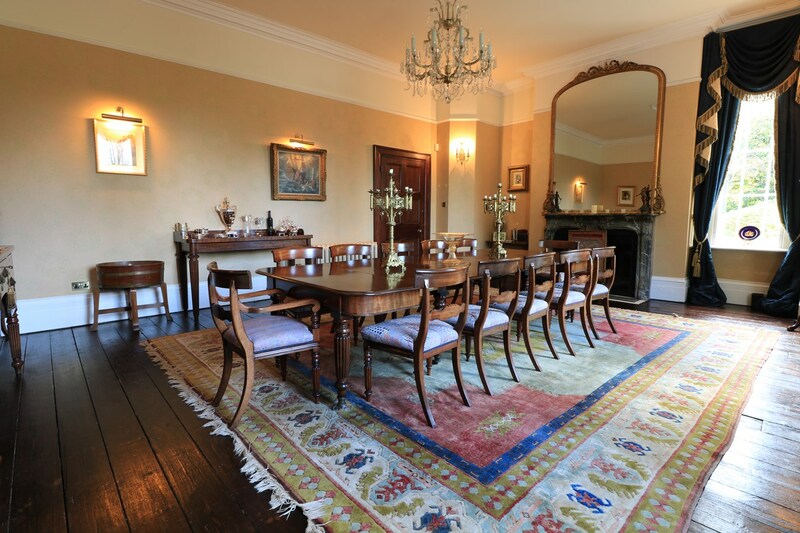 An exposed oak floor continues through to both the drawing room and dining room sitting in perfect Georgian symmetry either side of the hall. 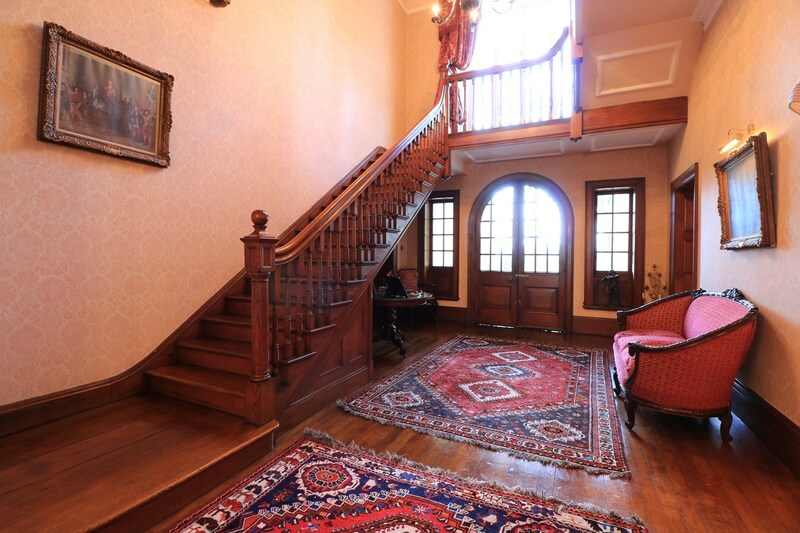 The imposing 12ft high ceiling and oak staircase draw the eye up to the galleried first floor landing. 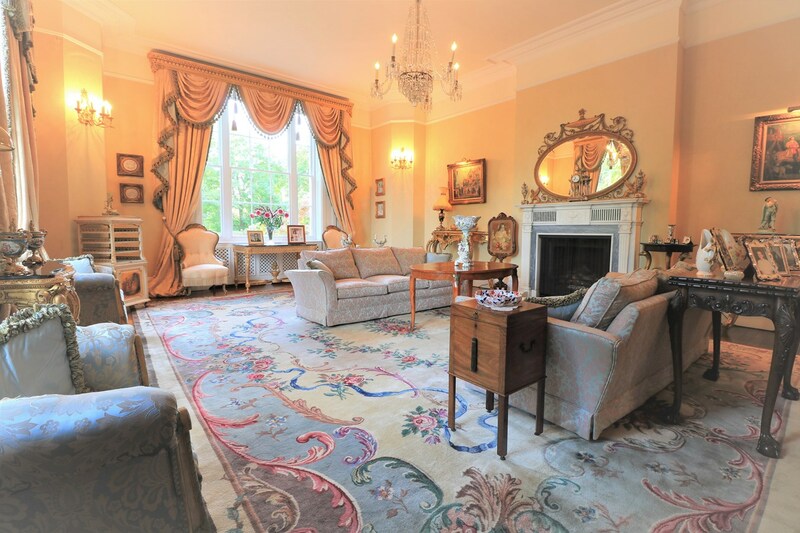 The formal drawing room is centred around the George III carved white marble fireplace. 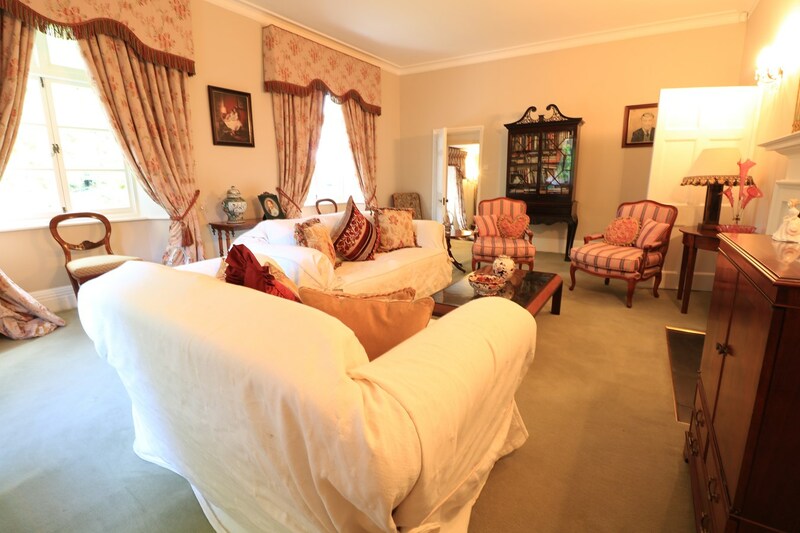 An opulent room bathed in light from the tall shuttered windows, overlooking the gardens with further views to the Skirrid. A 19th century carved marble fireplace is the focal point of the grand dining room with views across the drive and grounds. An inner hall leads through to the older original house where the ceilings become lower and the room proportions smaller giving the original part of the house a more informal feel. 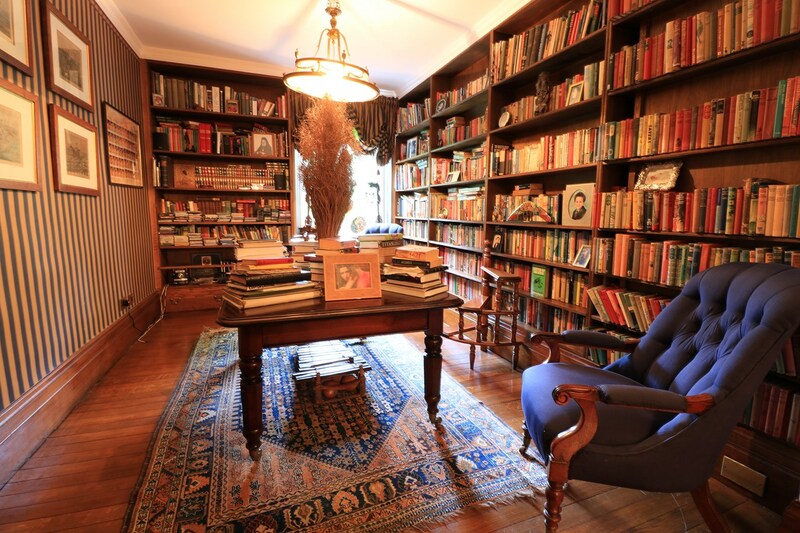 Fitted with wall to wall wooden bookcases, the open library overlooks the tranquil garden. 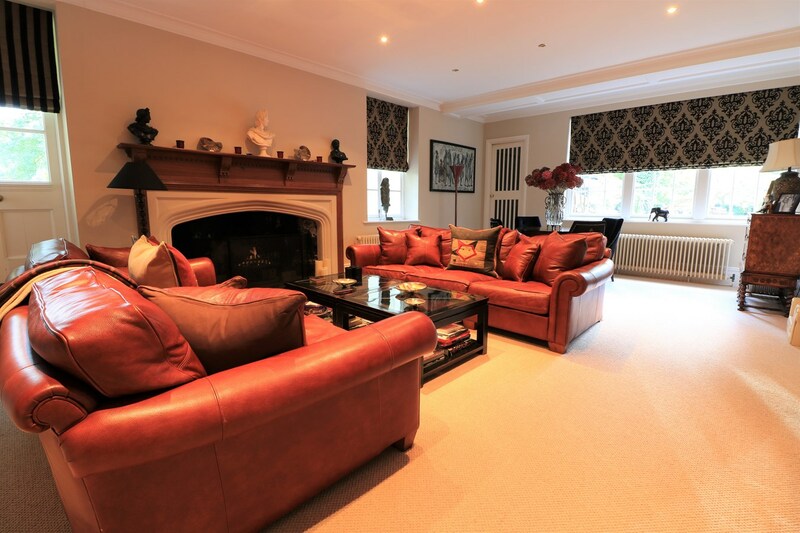 The light study has an iron fireplace with wooden surround and views over the grounds. French glazed shuttered doors lead to the grounds from the elegant garden room, a marble inlaid fireplace with wooden surround centres this principal reception. A large carved stone fireplace is the focal point in the modern feeling cinema room which has views over the courtyard and access to the gardens. 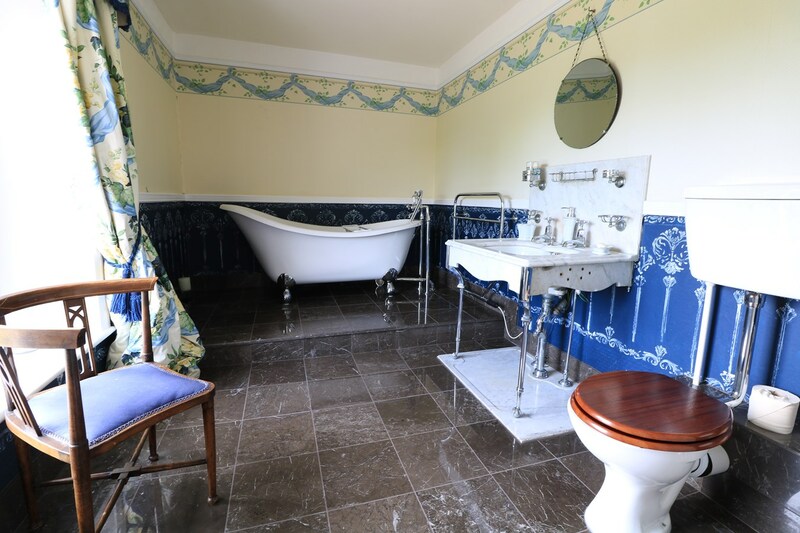 The cloakroom features one of many original ornate marble surround sinks which were reclaimed by the current vendors having been removed by the previous owners before them. The inner dining hall faces the courtyard and has a secondary staircase leading to both the upper floors and basement. The basement is accessed through a secure door accommodation comprising of a secure wine cellar, boiler room, pool table area, table tennis area and disco with a bar and dance floor where it is believed the Princess Margaret enjoyed a dance or two. The powder room has an opulent interior featuring a cast iron fireplace and sink inset into marble with a marble splashback. 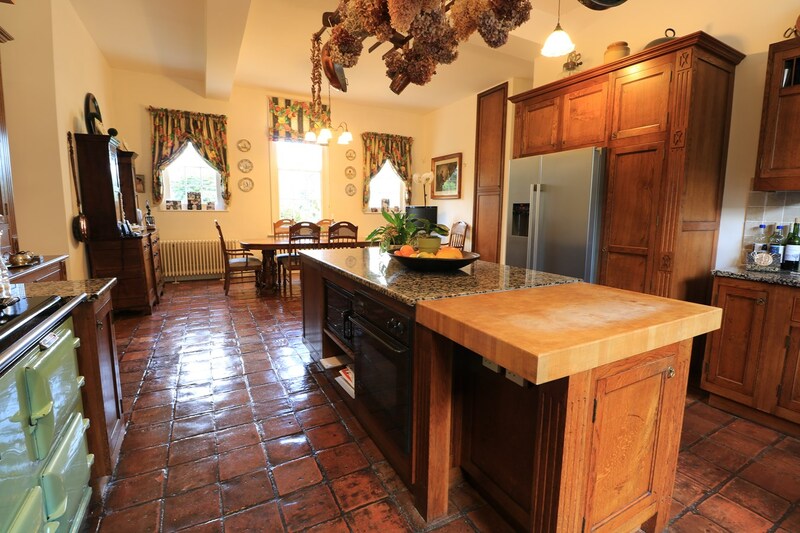 At the heart of the country style kitchen is a four oven Aga and central island with a spacious dining area to the opposite end. 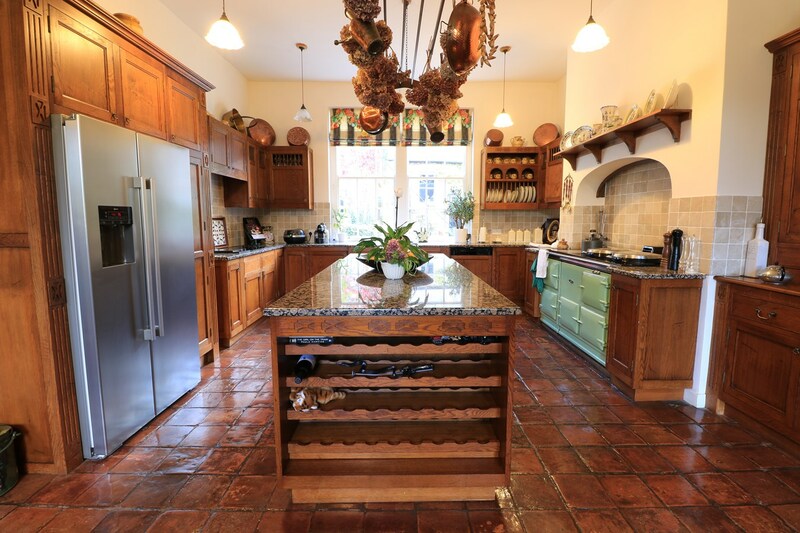 Extensively fitted with granite worksurfaces, inset butchers block and Belfast sink with courtyard views. A utility room and pantry lead off the kitchen. Accessible from the utility hall or its own external separate entrance, is a three-bedroom self-contained flat with lounge, kitchen and bathroom providing ideal accommodation for staff. 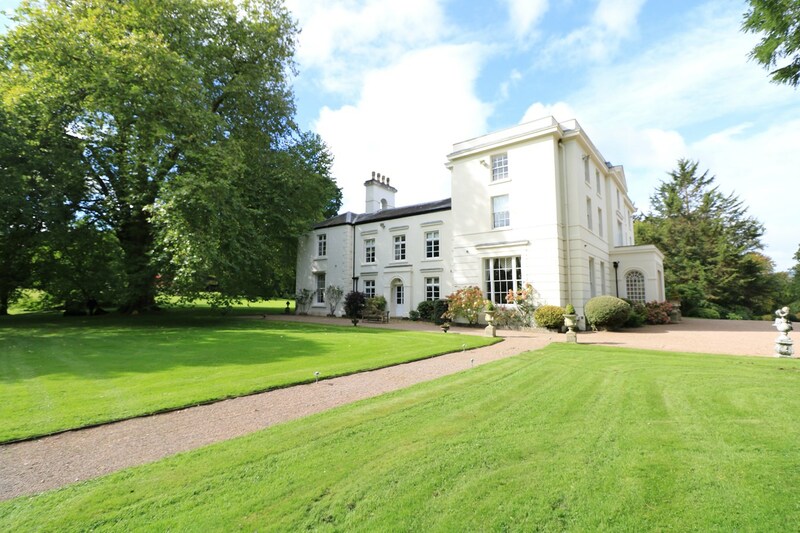 A large window on the galleried landing gazes over the front gardens towards the Skirrid. The landing divides the first floor into three suites. 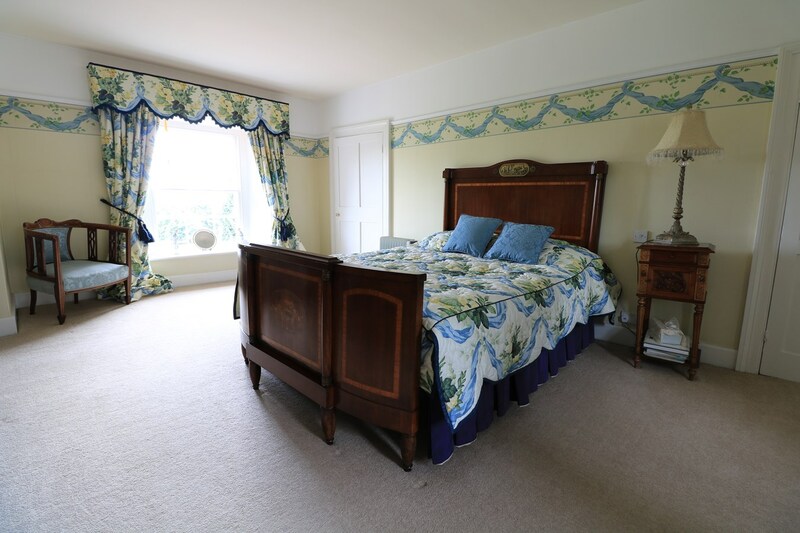 The master bedroom suite has views over the rear gardens. 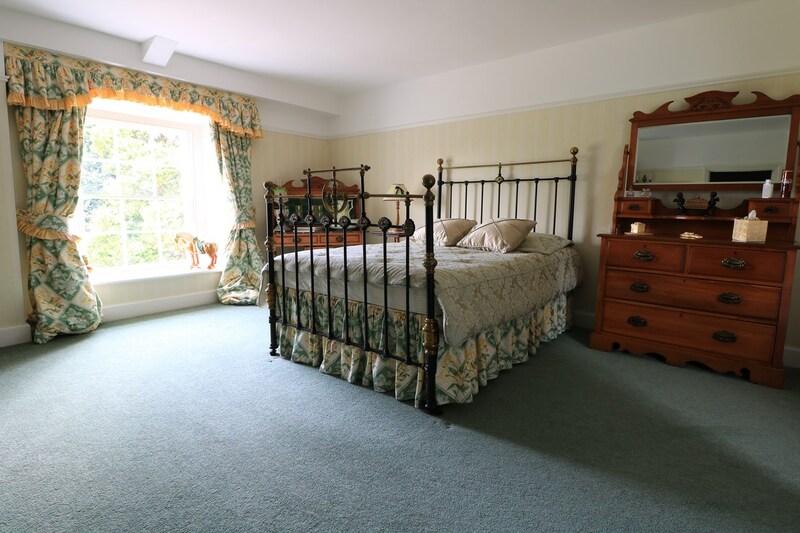 One side of the bedroom features a dressing room fitted with a range of wardrobes, the other has a cloakroom. Off the master bedroom is a sitting room with fireplace. Steps lead down to the en-suite marble tiled bathroom including his and hers inset sinks, roll top bath, WC and shower cubicle. 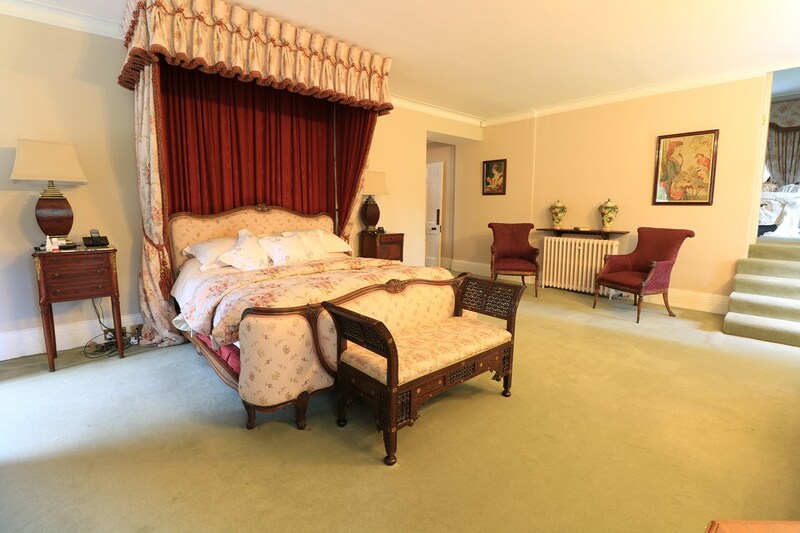 Bedroom Suite 2 - This dual aspect bedroom overlooks the Italian garden to one side and the Skirrid to the front and features a cast iron fire place. 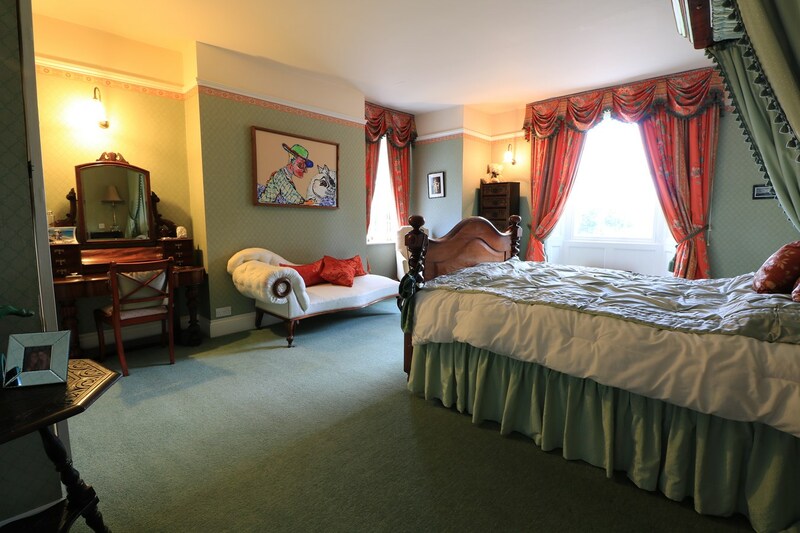 A separate bedroom/dressing room and Grecian themed bathroom are either side of the bedroom. These could remain as separate rooms or easily be converted into a suite. Bedroom Suite 3 - Front aspect bedroom, separate bedroom/dressing room and contemporary shower room with marble tiling are either side of the bedroom. Again, these could remain as separate rooms or easily be converted into a suite. Further bedroom with a side aspect view. Inner hall with original large airing cupboard, further storage cupboard and stairs to second floor. Bedroom 5 with views over the courtyard, a feature cast iron fireplace and eaves storage. 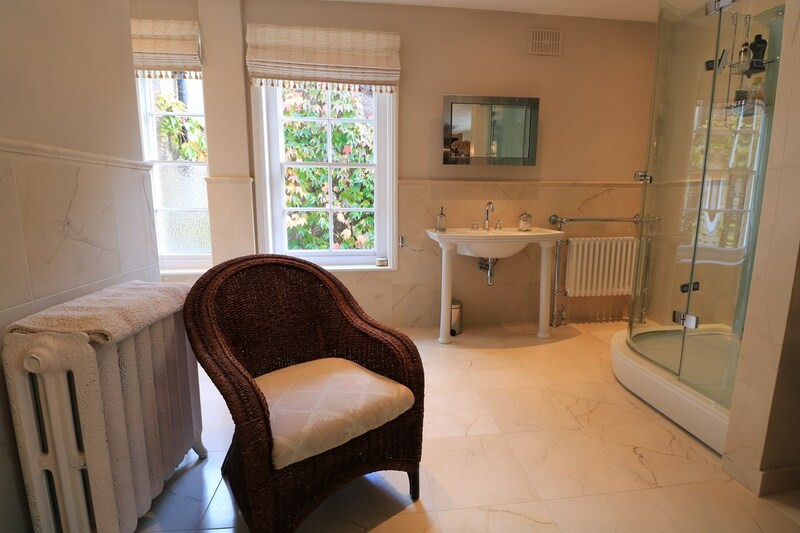 Separate W.C, with bathroom opposite comprising bath and sink, marble tiling. Further small landing with access to a good sized storage area and further bathroom with marble tiling, bath, W.C and sink. Steps up to a further landing. Bedroom 4 front and side aspect. 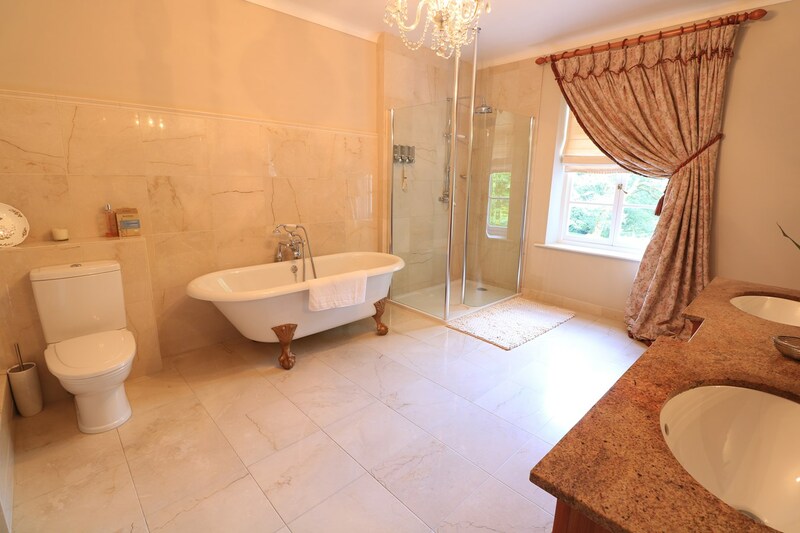 Bedroom 2 front aspect with en-suite bathroom, original ornate sink inset in marble with a marble splashback. Bedroom 1 dual aspect overlooking the courtyard and front gardens with an en-suite bathroom featuring roll top bath and antique sink. 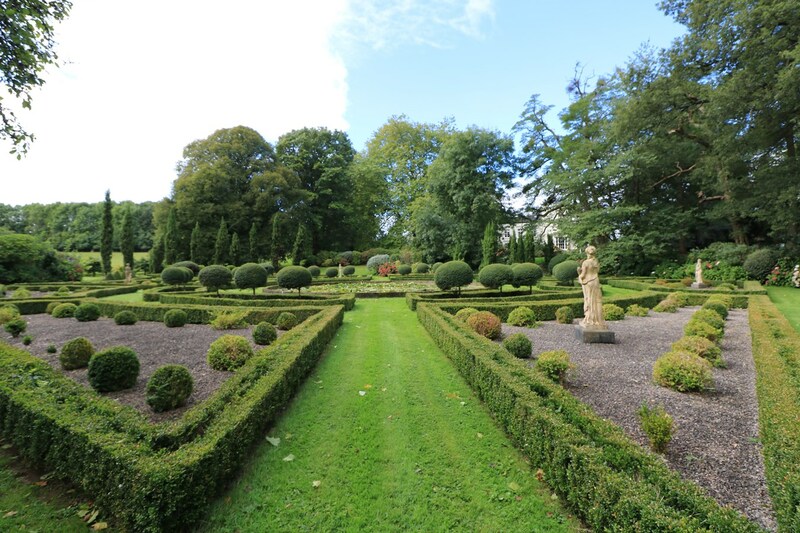 The surrounding grounds are split into paddocks, fields and formal gardens. 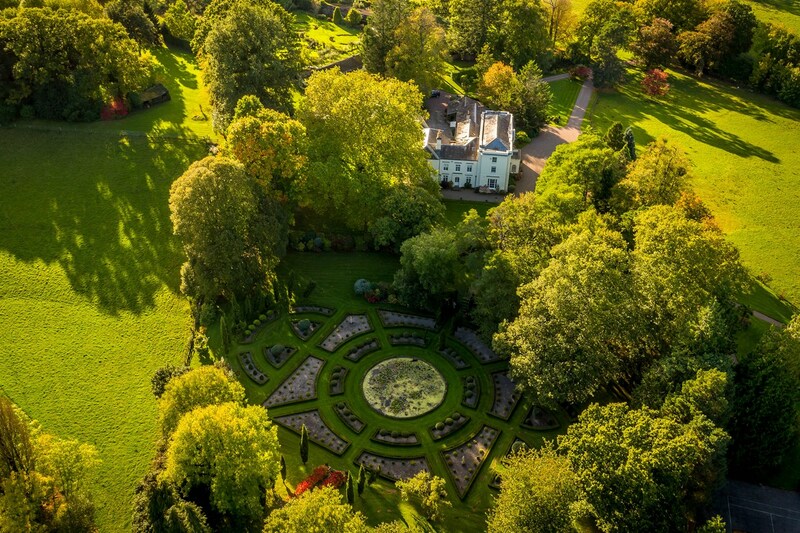 An Italian garden and walled garden sit amongst the extensive acreage and outbuildings. Within the grounds are an open-air swimming pool and tennis court serviced by a Greek style taverna with kitchen. Enclosing the courtyard are a series of outbuildings featuring two gardens stores, two workshops, hay store, three further stores, carports, and double garage. 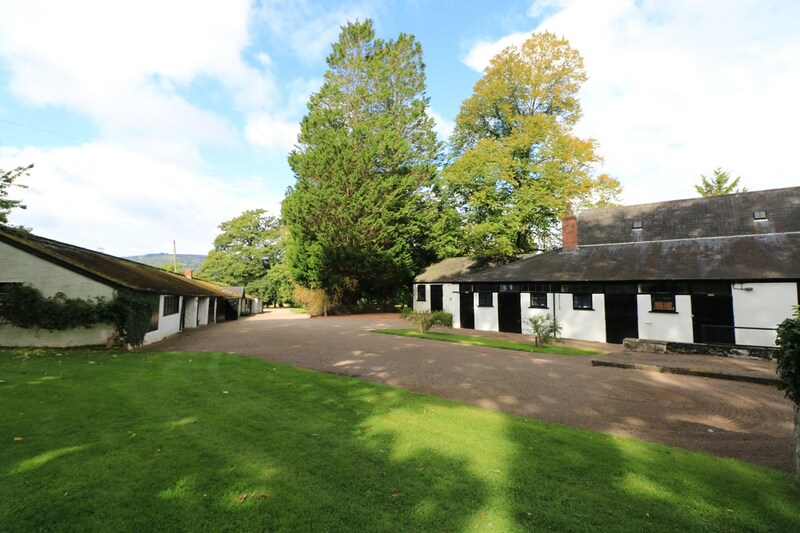 A further block of outbuildings includes eight stables and a four block stable, three stores, hay store, coach house with loft above and a double garage.